It’s OK, this new Norwegian television drama about heavy water. So far it’s not as earth-shattering as I was led to believe it’d be, but still fine. The thing is, it’s hard to beat an old Hollywood movie that manages to be fantastic entertainment while still being a bit OTT and not entirely true to reality. But at least this one does not star an unlikely Kirk Douglas. I don’t know how many people in Britain knew about this incident from WWII before the More4 screening of this big hit from Norway. In fact, I wonder how many Norwegians knew about it. If you’re older you will know, if only because you will have seen The Heroes of Telemark with Mr Douglas. I learned about it at school. It was a school radio programme, complete with leaflet to read, and interviews with the real people involved, who were still quite young, and perfectly alive, in the 1960s. I gather at least one of them still is. You live longer in Norway. Must be all that skiing. What I like about The Saboteurs, which is a shared production between Norway, Denmark and Britain, is that it covers everyone. The Germans are not merely the bad guys who are going to have that heavy water, no matter what. We see the – slightly mad – scientists, who live for their science. The bosses of Norsk Hydro are quite German-friendly, which comes as a bit of a shock. There is the slightly unnatural way everyone can chat to each other when they meet, in perfect English or German, but at least we see them ‘at home’ so to speak. It’s obvious that the settings described as London or Scotland are neither, but they try. 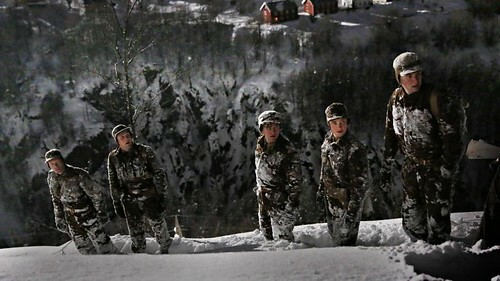 Rjukan is Rjukan, however, and that snow looks geniune enough. Two episodes in, I look forward to the rest. If the ending to the second episode had been fiction, you’d have accused the scriptwriters of being over-fanciful.